A Myanmar jade stone becomes a beautiful piece of jewelry or decorative art in the hand of a skillful artist. Probably the most genuine Myanmar Jade Market to buy the rough jadeite jade for this is in Mandalay. There is also plenty of fake jade around. Because Mandalay is the first place the green stone is delivered in Myanmar beside of the bulk which is shipped and smuggled over the border into China via Muse. Jade markets in Muse which is a small Chinese border town in northeast Myanmar where day and night the most rotten trucks carry jadeite rocks to the manufacturing centers in the north. The biggest markets in southern China for jade are Yunnan and Guangzhou where the jadeite boulders are shipped to. Transportation is usually from the Hpakan and Khamti jade mines to Myitkyina and after to China. Just imagine here is Myanmar (Burma) and over the border is a market with over around 2 billion people who consider jade as the stone of heaven and are eager to buy some products made from. Once the stones are over the border nobody talk about Myanmar anymore all becomes Yunnan jade. But there is no jade found in Yunnan. Myanmar's jade industries is one of the main 'cash cow" for foreign currency. Jade prices start to have a steep climb from here. But it needs to keep a few things with the stones in mind. All material which comes from Myanmar is jadeite and all other is nephrite which actually known as "Chinese Jade" and that mineral is imported mainly from Canada (BC) and Australia to China which is the largest market. Nephrite is the low price and jadeite is the high end. This brings it to the question where is jade mined which is answered further below because there is various stone material on the globe which is sold under the name of jade and has different properties and colors. Actually, the original jade mines "old China" usually refers to have been in Turkestan but are exhausted now. They also have a beautiful green stone from Afghanistan and Malaysia and even in Switzerland, they had a "Jadeland" long time ago. Since all this is quite an opaque situation people can make a lot of money since all run under the name jade in the shop and unless someone is not a specialist they just don't know, more is further below. On top of it taking Burmese jadeite jade for sale, Chinese people are constantly finding new ways to manipulate jade stones .and jewelry for sale by bleaching "bathing" and heating them. 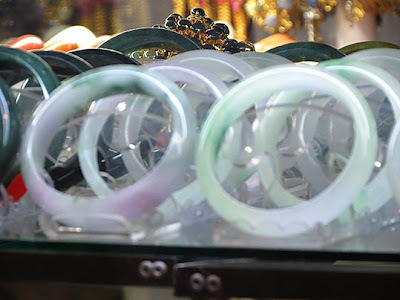 With the right tricks, it is possible to make a jade bangle which is maybe bought in the Bogyoke Jade Market in Yangon Myanmar for about $ 10,- a high-end jewelry which can be sold over $ 500,-. Here is more about jade bangles and other jewelry made from the semi-precious stone. 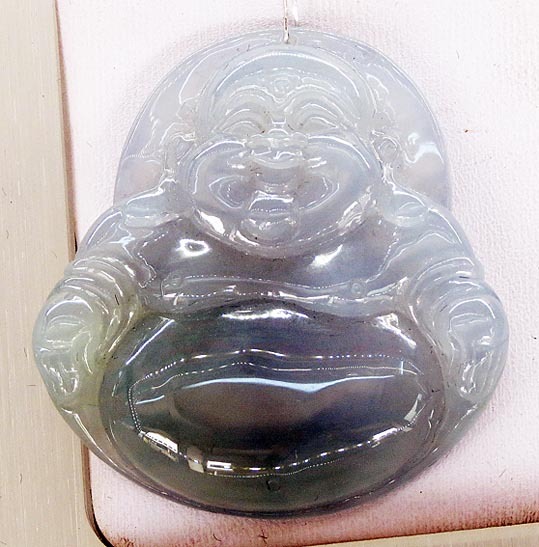 Variants of Myanmar jade available mean colors shapes sizes and carvings which are often a Buddha Statue or a mythical dragon and other image relief. Want to see a real dragon fight?. The items shown here are all made from jadeite no nephrite and they clearly indicated the variety of colors available. This is also stylish fashion decorations since they fit any color trend. When the style and color nicely fit the material it is placed into everything comes together fine and looks quite elegant​​ especially when the jade jewelry is made from a excellent rough jade stone. A interesting place of information for rough jade for sale from a Chinese perspective since they are generic and have a good knowledge from their perspective. 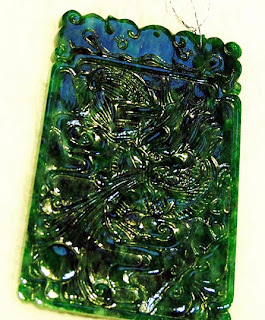 For Jade jewelry the green stone is usually used with white gold or silver often decorated with some diamonds. These pieces of jewelry are not only preferred by ladies there are also Chinese men who wear them plus in the last years black jadeite also became a macho fashion item with men in general. The green stones are ideal for carvings and also heavy used for top quality Jade Buddha statues and other gorgeous sculptures. Of course, other jewelry can be found in the Bogyoke Market such as necklaces and other made from Burmese jade stone s found in the Myanmar mountains of Kachin State north of Myitkyina City. Those are quality items, rather rare and quite expensive, prices are continuously rising because more Chinese people can afford to buy it. This is almost total driven by buyers from the "Red Communist Kingdom" but the best bazaar is not there, it's in Yangon Myanmar which is the Bogyoke Aung San Market. Not even the well known "Guangzhou jadeite Jade market" can match this read more.Browsing for jade jewelry these days leads sooner or later to silver which is very decorative. Together with the green color it rather radiates a cool appearance. The white metal is not only pretty but very useful for certain applications. A major drawback for the metal is that it gets tarnished on contact with air and need frequent cleaning. In the photo industry and other applications, it was and still is used heavy. Silver jewelry is also used by many tribes all over the world typical is turquoise and as we have it here jade and jadeite. Native Americans used it often with turquoise to create pretty silver pendants great looking earrings and anklets. Some time ago I bought a small sailing ship in Yangon's Bogyoke market it was created from pure silver but difficult to keep it clean as indicated above. Rings made of Silver are considered to be a refined ornament worn by people who have good taste. Unlike Gold, it shows that the wearer has an individual taste for pretty things and not just for the value of the metal. Where to buy the best Myanmar jade? For sure in the Bogyoke Market in Yangon.and at the sales fair in the biannual Emporium at Naypyidaw. For the rest of the years check the Bogyoke Market in Yangon or travel to Mandald other items are there. Take a tour guide with you otherwise, you won’t find the places. Just tell them you want to see workshops and wholesale. 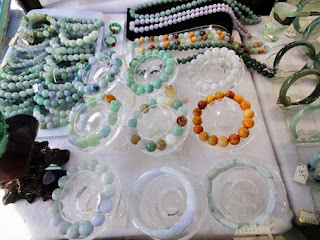 There are also several interesting jadeite jade wholesale and retail markets in Mandalay City. Be sure you remember the place but if someone is with you don't talk about business because they will command commission from the seller and finally you will pay that although it is not visible for you. In general, never take anyone with you when you want to buy something because all of them want your money naturally the seller but there is no reason to feed the tour guide or taxi driver. This is the same in Thailand where you get cheated on this stuff at every step you make. So go there alone the next day again and handle the business, don't take anyone with you also make sure that the taxi driver stops elsewhere before and he doesn't know where you go otherwise he will follow you telling he brought you there and want a commission. Raw jadeite stones, boulder, rocks and is the basic material where all this is made from but finally, the creative artist brings it to "life". Mining for jadeite jade is done in the Hpakant / Mogaung area and at Khamti in Sagaing division in north Myanmar; this is north of another famous gem area called near the Irrawaddy River. Mining is under control of Chinese and Shan people plus the military, local processing is done in Mandalay. Some miners search for dikes other for places where pebbles have been washed away by river torrents and settled in the river bed, this is known as "river jade". Is it genuine Myanmar Jadeite or fake? This question needs careful consideration because there are far too many manipulated, painted, bleached and whatever stones on the market. Don't underestimate this Chinese continuously find ways to treat the stones to look better by manipulation and after a few years the gem will deteriorate and be junk only. Why are they doing it? Because prices highly depend on the appearance especially the translucency, so many people treat the jewelry with bleaching liquid to make it more transparency this could push up the price 2 or 3 fold. Think bout genuine & natural jade not fake jade leads to a one simple parameter, if you buy for over $ 500,- have it checked by a lab of your choice don't accept a certificate the seller presents you because often this is "in house" papers or they just work together to cheat the buyer. Analyze & test the jade-stone with UV flashlights and dont buy the cheapest stuff. Recent developments which resulted in claiming to better by checking the light wavelength. Actually, it is a bit similar to the current method with a normal light as pictured above but the UV light is more accurate to judge the green stone. 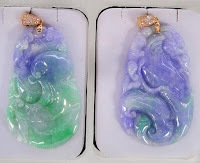 ​With Myanmar Jadeite Jade almost all colors from black to white are available. Although the genuine imperial green jewelry is fetching the highest prices. Other popular colors are lavender, white, purple and black. Manufacturers in China try to manipulate the gemstones by bleaching them with acid and filling cracks with raisin by applying high pressure and "doctor" the colors via heat treatment. The problem is that there are no common agreed parameters which can be used as parameters such as the 4Cs with ruby and diamond. 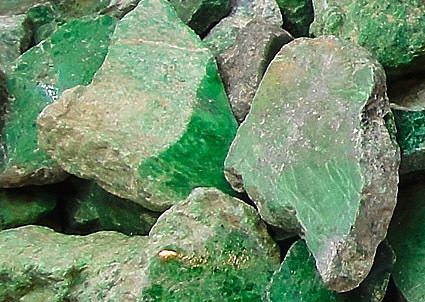 Mining of Jadeite jade is in Myanmar's Kachin State at Hpakant. Smaller jadeite depositis are in Khamti in the Saigaing Region. See the mining location at the map above right. To answer the question where jade is mined is not so easy since there are several different jades. There is the normal jade which actually is nephrite also known as "Chinese Jade" which in the past came mainly from Turkestan. In recent days the largest volume supplier is Canada with BC and Australia they are the main exporter of nephrite to China. In Myanmar the top-quality jade is Jadeite which is mined in Kachin state as shown here. A minor quantity of blue jadeite come from Guatemala and around. Already the old Olmecs had known where this was mined and they used this version of jadeite for religious items and jewelry. To bring the jade from Myanmar to the Chinese market behind the border. There are several steps but this first is to overcome the Kachin Independence Army which is also operating in the jadeite mining district that makes mining not so easy see the map above right. First are the local markets where the smaller raw rocks are sold. The next is the Mandalay Jade Market the biggest after the one in Yangon which again is sliced into several locations in the former capital. The reason is there is still some fighting between the military and the Kachin Independence Army (KIA). They are fighting for decades instead of sitting together make peace and give everyone the possibility to benefit from the precious underground. But part of the problem is drug production which is going on a bit to the east and all this is controlled by Chinese "warlords" who want to be left alone. A continuous back and forward between the different ethnic groups had the border shifting; actually, all of them are Chinese anyway in this case from Yunnan. There are several other centers for jadeite manufacturing and trading all over the country one is in Guangzhou. When the rough stone is over the border Myanmar's green jade stones becomes automatically Chinese. 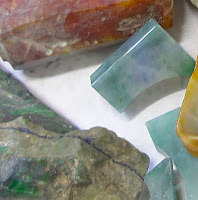 The precious stones are used for quality jewelry and sculptures today is jadeite jade from Myanmar (Burma), this are rough rocks, slabs, and boulders with all colors and most are exported to China either legally of by smuggling since both countries have a common border and it is easy to move back and forwards. Jade manufacturers in China buy the raw material and process it into jewelry and other pretty stones. That's the same as with nephrite from Canada and other mining areas. Every day and night throughout the year trucks with heavy loads pass the border in Myanmar's north-east to carry the precious material to the cutting centers Yunnan and further upcountry such as Guangzhou and elsewhere. The only substantial manufacturing in Burma is in Mandalay. The manufacturing is going on everywhere in the country only the supply routes have changed before nephrite jade came from Turkestan not it comes from Canada and Australia and jadeite from the southern border of Myanmar. In the 19th Century, they brought craftsmen from China to Mandalay. They made quality products made there which probably is a good idea but they wanted to do manufacturing more where the market is. This picked up again by the turn of this century when they allowed about a million Chinese to settle in the Mandalay area which brought tensions since they the guys from the north had much more money than the local and today (2016) most inner city belongs to them which is strange anyway because according to the law foreigners can't buy land. In upper Myanmar's Kachin State Jade Mountains are blasted apart. By using dynamite plus huge loaders and other heavy equipment to extract boulders and rocks. 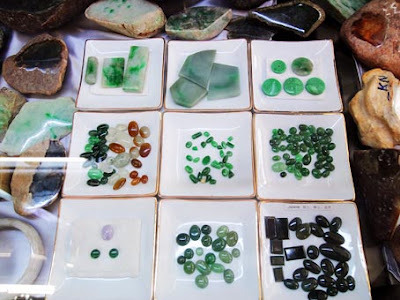 Because jadeite is a precious material which only can be found here (on a global scale) this creates tension with the local Kachin population since naturally, they want their shares of the wealth which are uncovered here and disappear with Chinese people who buy the protection from the military. There are still continuous fights between the Kachin Liberation Army and the regular Myanmar Military. This has another dimension too, not only raw jade because also opium poppies are grown a bit further east and the Chinese bosses don't want to be disturbed so they keep their own army. Time will uncover how that fits together with current democratization process. But often it is difficult to tell the difference between real and fake. Although the blue version can be found in Guatemala the main quantities come from Myanmar. Beside of being a very tough gem, only next to a diamond it has no much meaning for the buyer since he / she can’t test it anyway. A diamond has a ranking of 10 on the Mohs hardness scale, jadeite is softer with 7. It is considered a strong mineral because it is chip resistant. Nephrite is softer Mohs at 6.5, means high polishing is not advisable because it is prone to chip. People pay a lot of money for a high reflective and transparent stone. When buying jade gemstones another very important parameter is to be that the hue is similar all over without impurities, the cleaner the better because it is quite difficult to find a real clean stone. 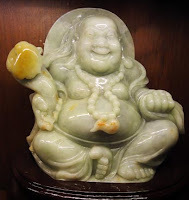 A jade stone is often dyed or heat-treated to enhance the color but be careful not to get a dyed piece because after about 3 years it will fade away and junk will be left. Some crooks try to sell dyed quartz and other stones as green jade if you don’t know what’s up have it checked in all bigger town where they sell “The Stone of Heaven” there have labs for analyzing.About the stone transparency. 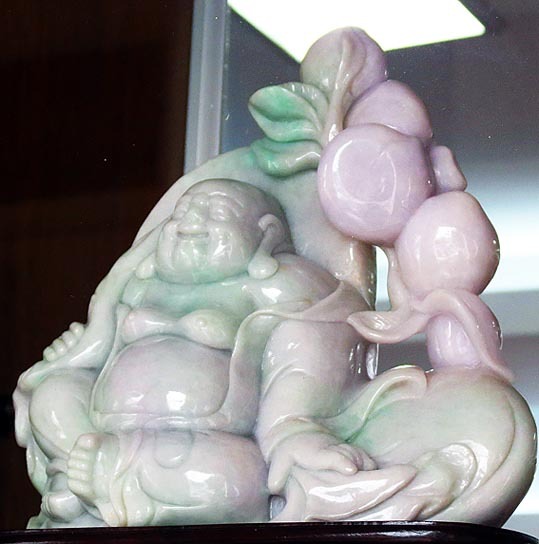 Sitting white jade statues are an asset in every house it won't matter if it is a home or an office. A white jade Buddha radiates calm and peace. It also shows that the owner has a wealthy background since this pretty thing has a substantial value. Jadeite Buddha sculptures of about 50 cm and upwards are not available below about $ 10k if they show a good material and artistic value. For such large pieces of jadestone to find one rock or boulder with a uniform color across the whole material is quite difficult, that makes it expensive. Jade stones usually always have plenty of veins with many colors and patterns. Below are pretty jade cabochonrings in silver settings. Burma (Myanmar) is known for a few subjects and products, which are Golden Pagodas, colorful green jadeite jade, rubies and sapphires and many more gemstones. 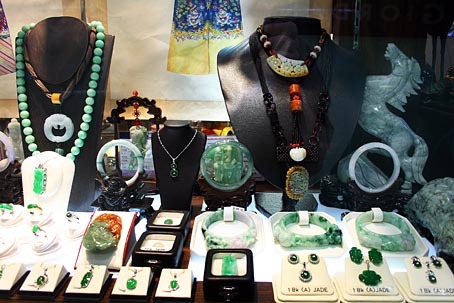 Conveniently the biggest market for the green stone is just across the mountainous border of Chinese Yunnan Region. Until recently most precious stones went there by smuggling just the same way as with corundum stones to Thailand. 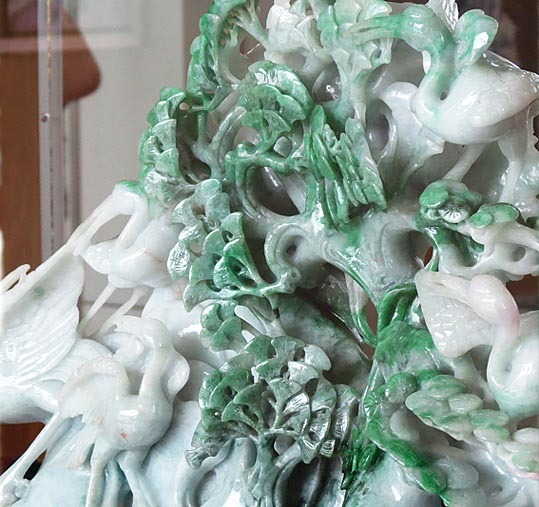 The modern Burmese jadeite jade trade gained momentum after several Chinese merchants visited the Mandalay Region and the middle of the 19th Century and recognized the larger business potential. Legends tell that one of them bought all available green stones, had them carried to Yunnan and got instantly very rich men. Because there is nothing that has a higher value for Chinese than money caravans to the north multiplied. The biggest challenge was to get the material to China because these trade channels were infested with bandits and criminals. In the 20th Century this trade expanded to a large one and climaxed in a $ 3 Billion turnover during the bi-annual Emporium in Naypyidaw in 2014 which was mainly fueled by demand from China and the Myanmar (Burmese) were not prepared to absorb such as huge sum in such a small timeframe so the exchange rate kyat â dollar went into a mess. The mineral has a high price tag especially when a few parameters come together, that means emerald like green color, luster and smooth and uniform texture, translucency and no cracks. 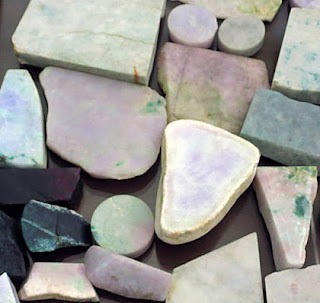 Natural Burmese jade & Myanmar jadeite green and other colored jade stone are the material to make jewelry and sculptures with a mystic touch. There are two variants, jadeite from Kachin State north of Mandalay and nephrite from China and another place such as BC Canada, Australia, New Zealand and other.mines worldwide. Green jadeite jade from Burma (Myanmar) is the worldwide number one in deposits and production. The difference between this two stone variants is the quality of the raw material.. Probably the most genuine jade market in Myanmar is in Mandalay because this is the first place the green stone is delivered beside of the bulk which is shipped and smuggled over the border via Muse. But for buying Myanmar Jade jewelry the best is probably Yangon's Bogyoke Market. Actually Muse itself is a interesting jade trading place with a huge stone bazaar although worn down but still going strong with Jade jewelry attraction. Muse is a small Chinese border town in northeast Myanmar where day and night rotten Chinese trucks carry jadeite rocks to the manufacturing centers in the north. This is always Myanmar Jade with different colors and qualities. 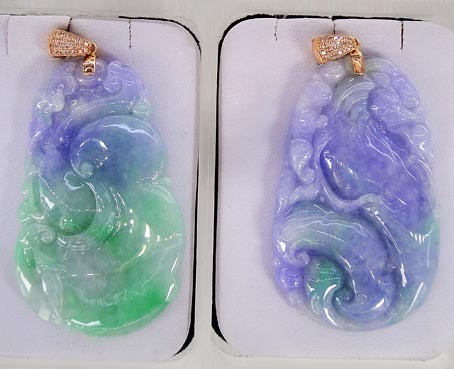 Natural Burmese jade & Myanmar jadeite with green and other color such as lavender are the material to make jewelry and sculptures with a mystic touch. There are two variants, jadeite from Kachin State north of Mandalay and nephrite from China and another place such as BC Canada, Australia, New Zealand and other.mines worldwide. Green jadeite jade from Burma (Myanmar) is the worldwide number one in deposits and production. The difference between this two stone variants is the quality of the raw material. The biggest markets in southern China for Myanmar Jade are in Yunnan and Guangzhou where the jadeite boulders are shipped to make jewelry and sculptures. Shipping the Myanmar jadeite jade to China is usually from the Hpakan and Khamti mines to Myitkyina and after to China. Just imagine here is Myanmar (Burma) and over the border is a market with over around 2 billion people who consider jade as the stone of heaven and are eager to buy some products made from. Once the stones are over the border nobody talk about Myanmar anymore all becomes Yunnan Jade. This leads to the question where is jade mined which is answered further below because there is various stone material on the globe which is sold under the name of Jade and has different properties and colors. Actually the original jade mines in "old China" usually refers to have been in Turkestan but are exhausted now. They also have a beautiful green stone from Afghanistan and Malaysia and even in Switzerland, they had a "Jadeland" long time ago. Since all this is quite an opaque situation people can make a lot of money since all run under the name Jade in the shop and unless someone is not a specialist they just don't know, more is further below. 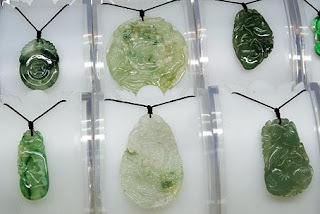 On top of it taking Burmese jadeite jade for sale, Chinese people are constantly finding new ways to manipulate jade stones .and jewelry for sale by bleaching "bathing" and heating them. With the right tricks, it is possible to make a jade bangle which is maybe bought in the Bogyoke Jade Market in Yangon Myanmar for about $ 10,- a high-end jewelry which can be sold over $ 500,-. Here is more about jade bangles and other jewelry. For Jade jewelry the green stone is usually used with white gold or silver often decorated with some diamonds, more information is here. This piece of jewelry is not only preferred by ladies there are also plenty Chinese men who wear them. The green stones are ideal for carvings and also heavy used for top quality Jade Buddha statues and other gorgeous sculptures. Of course, other jewelry can be found in the Bogyoke Market such as necklaces and other made from jade stone found in Myanmar. Those are quality items rather rare and quite expensive jade prices are continuously rising because more Chinese people can afford to buy it. This is almost total driven by buyers from the "Red Communist Kingdom" but the best bazaar is not there, it's in Yangon Myanmar which is the Bogyoke Aung San Market. 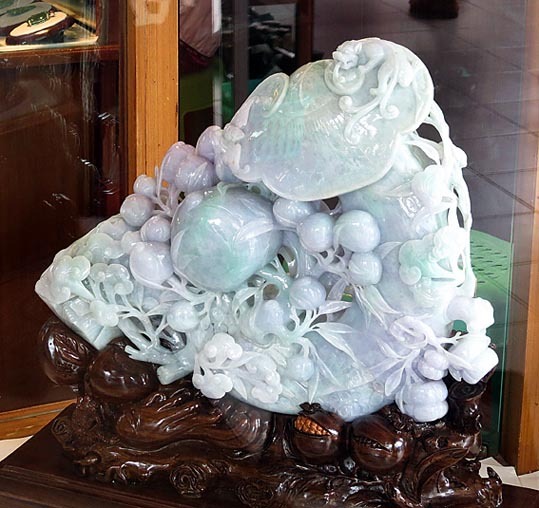 Not even the well known "Guangzhou Jadeite Jade market" can match this read more. Today the high-end quality fashion designers use Myanmar Jadeite because this material has the best colors, textures and the overall appearance is just better than the other. Searching for jade jewelry these days leads sooner or later to silver creations paired with the green stones a color combination which is very decorative. Silver jewelry is also used by many tribes all over the world typical is turquoise and as here jade and jadeite. Native Americans used it often with turquoise to create pretty silver pendants great looking earrings and anklets. Some time ago I bought a small sailing ship in Yangon's Bogyoke market it was created from pure silver but difficult to keep it clean as indicated above. Rings made of silver and jade are considered to be a refined ornament worn by people who have good taste. Unlike Gold, it shows that the wearer has an individual taste for pretty things and not just for the value of the metal. In 1857 when King Mindon of Burma moved the capital from Amarapura to Mandalay Chinese merchants also moved and started a cutting and carving cottage industry. In 1861 a merchant from Canton visited the city and bought all jadeite stones and items available in town to take them back with him. He sold them all after arrival and became instantly a very rich man. The news spread and people from Yunnan came down and applied for a royal permit to mine for the green stones. About fascinating Myanmar (Burmese) Jade, when it started there was a rush in Mogaung, upper Burma, many of the would-be miners died of malaria, or were looted and killed by gangsters at the trade route. 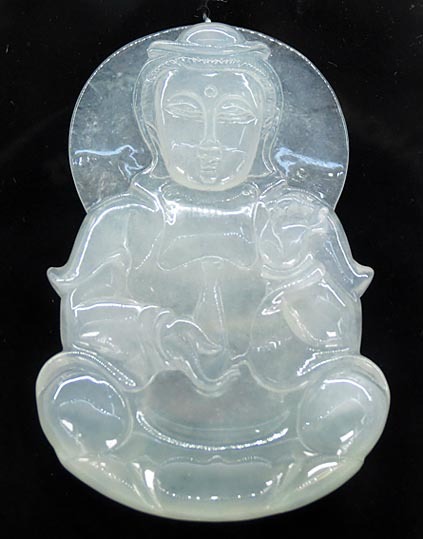 Nephrite jewelry and sculptures are widely available and often carry a moderate price tag. When buying higher priced items insist on a spectroscopy test in a lab since plenty of dirty business is going on. 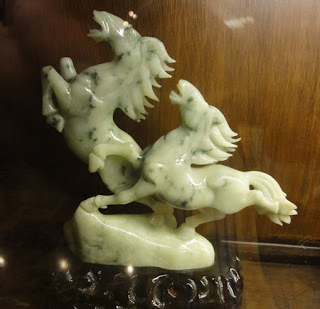 Today nephrite is mostly imported to China from BC Canada similar to jadeite which comes from Burma and becomes usually "Chinese Jade" once it's over the border. Between the two countries brisk business is done with the gemstones, also the top artists to handle it are across the border somewhere between Yunnan and the Beijing there are many factories because that's also the biggest market for the green stone. As a matter of fact, most people don't know about the two variants. Common colors are green, white, red, purple, lavender and yellow, this is also most popular, emerald or Imperial has the highest commercial value. It fetches top prices with rich color, good brightness and a high level of translucency. This is defined as translucent, opaque, emerald green and as indicated the most transparent, the higher the value. Here is "Chinese Jade" carving. Texture refers to the structure since it is a composition of various minerals, it has a mostly fibrous and granular structure. If there are spots, cracks etc. the value tumbles. If the grain size is small and showing a good opaque structure prices are high, actually there is no limit at the top. According to the particle size of the mineral, it can be divided into the dense texture with fine grade and medium and coarse grain size. Considering all this parameter it is visible how difficult evaluation is. This parameter is for both type of the stone, the main difference is jadeite has better much better colors, textures and is harder. The typical jadeite mining area in Myanmar is Hpakant in northwest Myitkyina District of Kachin State, that's about one thousand kilometers north of Yangon. Mining of Jadeite Jade is in Myanmar's Kachin State in the Hpakant Region. Smaller jadeite deposits are in Khamti in the Sagaing Region. See the mining location at the map above. To answer the question where jade is mined is not so easy since there are several different jades. There is the normal jade which actually is nephrite also known as "Chinese Jade" which in the past came mainly from Turkestan. In recent days the largest volume supplier is Canada with BC and Australia they are the main exporter of nephrite to China. In Myanmar, the top-quality jade is jadeite which is mined in Kachin state as shown here. A minor quantity of blue jadeite come from Guatemala and around. Already the old Olmecs had known where this was mined and they used this version of jadeite for religious items and jewelry. The easiest to find reasonable prices for value is to click on the picture above that will lead you to one of our sources who have according to our hard evidence very user-friendly prices. This is not "wishful thinking" as it is so much in the jade business this is based on facts. Beside of the jade this small Chinese border town in northeast Myanmar has a totally unrestricted nightlife actually Muse has the hottest nights in Myanmar even more unrestricted than Thailand nightlife. The biggest markets in southern China for Jade are Yunnan and Guangzhou where the jadeite boulders are shipped to. Transportation is usually from the Hpakant and Khamti jade mines to Myitkyina and after to China via black markets and legal border crossings. They find the precious stones in Kachin States Hpakant / Mogaung area and at Khamti in Sagaing division in North Myanmar. This is north of another famous gem area called Mogok near the Irrawaddy River. Mining is under control of Chinese and Shan people plus the military, local processing is done in Mandalay. Some miners search for dikes other for places where pebbles have been washed away by river torrents and settled in the river bed, this is known as "river jade". Want to do some shopping for jewelry and sculpture probably the best is to travel to Yangon and have a look in the shops at the Bogyoke Market, this is the biggest jadeite market on earth and they have real genuine stuff just see the pictures.Just imagine here is Myanmar (Burma) and over the border is a market with over around 2 billion people who consider Chinese jade and Myanmar jadeite as the stone of heaven and are eager to buy some products made from. Once the stones are over the border nobody talk about Myanmar anymore all becomes Yunnan Jade. Every day and night the most rotten trucks carry jadeite rocks stones and boulders to the manufacturing centers in South China. Actually, Muse City itself is a very interesting jade trading place. Jade trader in Muse are many and it is very similar to Mae Sot in Thailand including the cheating on every second corner. For the rest of the years check the Bogyoke Market in Yangon or travel to Mandalay. There have a look around the Mahamuni Pagoda there are an almost open air market and workshops. This is probably the best option for buying green imperial jadeite jade and other since all shops which produce jewelry, sculptures, and other items are there. Take a tour guide with you otherwise, you won’t find the places. Just tell them you want to see workshops and wholesale. There are also several interesting jadeite jade wholesale and retail markets in Mandalay City. Be sure you remember the place but if someone is with you don't talk about business because they will command commission from the seller and finally you will pay that although it is not visible for you. In general, never take anyone with you when you want to buy something because all of them want your money naturally the seller but there is no reason to feed the tour guide or taxi driver. On top of it taking Burmese jadeite jade for sale Chinese people are constantly finding new ways to manipulate the stones and jewelry for sale. A popular methode is bleaching which means a brocess "bathing" them in acid and heating them up. With the right tricks it is possible to make a jade bangle which is maybe bought in the Bogyoke Jade Market in Yangon Myanmar for about $ 10,- a high-end jewelry which can be sold over $ 500,-. Here is more about jade bangles and other jewelry. Variants of jade available mean colors shapes, sizes, and carvings which are often a Buddha figurine dragon and other image relief. The items shown here are all made from jadeite no nephrite and they clearly indicated the variety of colors available. This is also stylish fashion decorations since they fit any color trend. When the style and color nicely fit the material it is placed into everything comes together fine and looks quite elegant. Not even the well known "Guangzhou jadeite jade market" or Hong Kong can match this actually they have plenty of pretty jade jewelry ornaments statues and other art creations but there is no much stone quality they manipulate too much via heat enhancing bleaching acid bath and whatever. Many Chinese had about 6000 years until now to find the best ways how to cheat the user by manipulating the pretty green imperial jade. Objects such as a Jade Buddha & Jewelry carry a mystic aura and are very decorative elements on the body in a home, temple or other places. Most sought after are jade jewelry and Buddha statues since a long time ago they were everyday household items. They were used in Old China in Burma or Myanmar by the Olmecs and other are. Jade items get quickly very expensive according to the size, artwork, texture, color and translucency of the mineral. Most expensive items are of "imperial jade" which is a saturated green with a smooth and flawless texture. 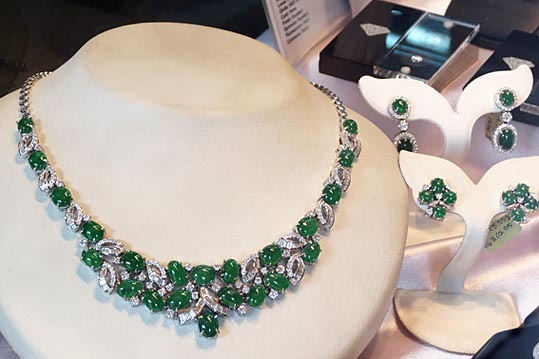 Jadeite jewelry items fetch the highest prices and this shop in Singapore is at the high end of the list. On the other hand, they have good quality pieces. It looks like their products are made from exquisite jade stones. Very popular is jade jewelry. Mainly worn on the wrist as bangles bracelets often with green white and lavender color styles they are thin and round plus bands. Sometimes they are made by several pieces and fixed together by a spacer or maybe several bigger balls on a string. There are many possibilities to create this jewelry either with gold, maybe just a simple string or with the spacer made from silver and plenty of colors available. Because bracelets are some of the most sought after jade items an overwhelming variety is available which makes it often difficult to find what you really like it’s a similar situation with bangles and pendants. 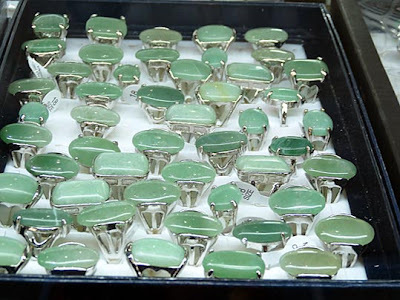 There are several parameter which determine the price, this are, has the jewelry a uniform color preferably saturated green just as fresh grass, how is the translucency, the higher the transparency is the higher the price and is it nephrite (the common “Chinese Jade”) or jadeite which is the Myanmar (Burma) version and usually more expensive because the quality is higher. Here is a short clip to give you an idea how jade jewelry is made. Objects such as a Jade Buddha & Jade Jewelry carry a mystic aura and are very decorative elements on the body in a home, temple or another place. Where to buy the best Myanmar jade? At the biannual Emporium at Naypyidaw and the Bogyoke Jade Market in Yangon Myanmar (Burma) which is one of the premier trading places for jadeite worldwide. Here mostly finished goods such as jewelry, ornaments, and statues are sold. Or travel to Mandalay there have a look around the Mahamuni Pagoda there are an almost open air market and workshops. This is probably the best option for buying green imperial jadeite jade and other since all shops which produce jewelry, sculptures, and other items are there. Is it genuine Myanmar Jadeite jade or fake? Think bout genuine & natural jade not fake jade leads to a one simple parameter, if you buy for over $ 500,- have it checked by a lab of your choice don't accept a certificate the seller presents you because often this is "in house" papers or they just work together to cheat the buyer. Analyze the jadestone with UV flashlights Recent developments which resulted in claiming to better by checking the light wavelength. 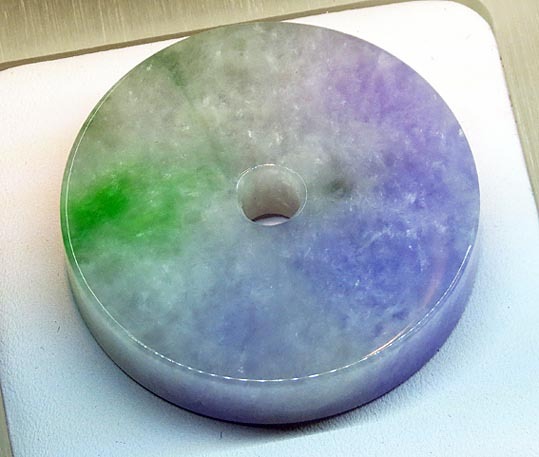 Actually, it is a bit similar to the current method with a normal light as pictured above but the UV light is more accurate to judge the green stone. With Myanmar Jadeite Jade almost all colors from black to white are available. Although the genuine imperial green jewelry is fetching the highest prices. Other popular colors are lavender, white, purple and black. To bring the jade from Myanmar to the Chinese markets behind the border are several steps but the first is to overcome the Kachin Independence Army which is involved in a civil war and is also operating in the jadeite mining district. That makes mining not so easy see the map above right. The material used for quality jewelry and sculptures today is jadeite jade from Myanmar (Burma), this is rough rocks, slabs, and boulders with all colors and most are exported to China either legally of by smuggling since both countries have a common border and it is easy to move back and forwards. Every day and night throughout the year trucks with heavy loads pass the border in Myanmar's north-east to carry the precious material to the cutting centers Yunnan and further upcountry such as Guangzhou and elsewhere. The only substantial manufacturing in Burma is in Mandalay. In Myanmar's Kachin State Jade Mountains are blasted apart. First the local Burmese markets receive supply. The next is the Mandalay Jade Market the biggest in the county together with Yangon which again is sliced into several locations in the former capital. Where is raw jade stone available? 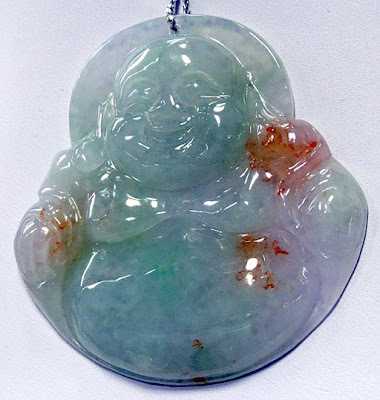 A jade stone is often dyed or heat-treated to enhance the color but be careful not to get a dyed piece because after about 3 years it will fade away and junk will be left. Some crooks try to sell dyed quartz and other stones as green jade if you don’t know what’s up have it checked in all bigger town where they sell “The Stone of Heaven” there have labs for analyzing. For such large pieces of jade stone to find one rock or boulder with a uniform color across the whole material is quite difficult, that makes it expensive. Jade stones usually always have plenty of veins with many colors and patterns. The biggest challenge was to get the material to China because these trade channels were infested with bandits and criminal gangs. Another push for Burmese (Myanmar) jadeite jade upwards was the fact that in the last century the mines in China got depleted (Hetian and more) actually the stones mined there and in today Tajikistan is the lesser quality Nephrite Jade currently (2016) most of this comes from BC in Canada and practically all top-quality jadeite jade is mined in Myanmar (Burma) since there are no other places it is found on mother earth. The rather small mining which is going on in Central America is blue jadeite only. Natural Burmese jade & Myanmar jadeite green and other colored jade stone are the material to make jewelry and sculptures with a mystic touch. There are two variants, jadeite from Kachin State north of Mandalay and nephrite from China and another place such as BC Canada, Australia, New Zealand and other.mines worldwide. Green jadeite jade from Burma (Myanmar) is the worldwide number one in deposits and production. The difference between this two stone variants is the quality of the raw material. It is said that there are groups of Chinese people behind the jade and drug business some are Myanmar citizen and other from elsewhere in China who run the business via a local proxy. Although there is no direct visible relation they are closely connected with the military who do the protection and the Chinese supply the money. In Myanmar nobody has the investment necessary do large scale mining operations as they do just see the pictures. But there are two main problems one is the resistance of the local Kachin people who naturally want a share of the "jade cake" since this is their state. They are somehow represented through the "Kachin Independence Army". The other problem is mainly the rough terrain which they try to overcome by blasting whole "Jade Mountain" apart to get access to the "Stone of Heaven". Here visible in raw jade.